Tapas: Spain’s foremost modern culinary export, leaving paella for dust, copied from Tokyo to Toronto via many other places in between. An old tradition perfectly suited to modern habits, ideal for grazing, eating on the hoof, informal with none of that restaurant fuss. So much so there are now umpteen books on how to do the perfect tapa, and probably degree courses in tapa-construction. Truth is though that in the process of gaining all this fame, back in Spain tapas have lately been undergoing a transformation, to the extent that they’re often completely unrecognisable from the easygoing, no-frills snack of just a few years ago. They’ve got fancy. 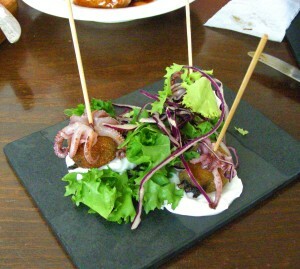 In southern Spain, above all, the average tapa was traditionally and up until very recently a simple thing. Not so in the Basque Country in the north, which has always had its own cuisine much more given to intricacy and subtle ingredient combinations. Elsewhere, even Catalonia – now a watchword for foodie sophistication – applied its refined culinary creativity above all to main dishes, not tapas, which were an imported tradition not given much attention. And in Andalusia tapas were simplicity itself. A bowl of olives, the most basic kind of tapa that came automatically and for free whenever you ordered a drink (a generous tradition that at least in Seville now seems to be sadly extinct). Slices of Ibérico ham or chorizo, just laid out on a plate. Albóndigas, meatballs in sauce. Plain grilled prawns, cuttlefish or other seafood. Crisp sautéd potatoes in brava sauce. Plates of pescadilla, the most universal Andaluz tapa, tiny, crisp fish flash-fried in batter. The most ‘elaborated’ thing would probably be the equally universal ensaladilla rusa or ‘Russian salad’, potatoes, red pepper, onion, tuna and maybe other things in mayonnaise. Tapas were not carefully designed. Menus wouldn’t vary much, and when tapas were at their best the stay-in-the-mind-and-on-the-tongue features of the experience came from the sheer freshness and pure quality of basic ingredients, their full-on natural gutsiness, rather than any finesse or imagination in presentation. Indeed, local eaters addicted to the simple commonly shunned any kind of elaboration, such as, for example, the perversity of combining fresh seafood with a sauce, as unnecessary pretension, spoiling a good meal, an alien practice vaguely associated with the French. • Tapas have taken over. They used to be just a preliminary, an aperitif, to be nibbled over with a drink before going on to a full meal. Now, a majority of the who-knows-how-many bar-restaurants in central Seville, especially the recently-opened trendy ones in a city that like others in Spain has become markedly more trend-aware, seem to have menus made up only of tapas and raciones, larger-size tapas for anyone needing more than the trad small portion. It’s almost like this is the only form of Spanish food there is anymore. Unless you go upmarket, restaurants offering the once-standard three-course menu of primer plato, segundo and postre are getting hard to find. • Tapas no longer come on plain round plates or the little oval bowls used for smaller ones. Instead, presentation demands imaginative tableware that is square, hexagonal, wavy-sided. Or slabs of slate or granite. Probably with a drizzle of balsamic vinegar down one side. • And tapas have become intricate, exquisite, complex, multilayered, fancy. A millefeuille of tuna, courgette and crushed tomatoes. Cod with bacon, subtle spices and a cream of red cabbage. Oriental ingredients – sushi, lemongrass – and techniques – fish seared tataki-style – abound, along with seasonings harder to pin down. 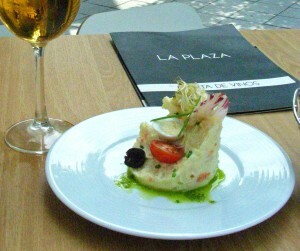 Even trad things like an ensaladilla come with unheard-of extras and delicately sculpted. It’s as if a region famed for culinary stick-in-the-mudness has suddenly gone a bit light-headed. A great local foodie blog, Sibaritas por Sevilla (http://www.sibaritasporsevilla.es/) jokes that this could all be down to the influence of one Jordi Cruz, Michelin-starred Catalan chef and star judge on the Spanish edition of MasterChef, which first aired in Spring 2013. He’s also a good-looking young dog, which helps. The highly refined, experimental Catalan cuisine made famous by megachef Ferran Adrià and his followers originally focused on fine dining, as I’ve said, but for the last ten years or so they’ve paid more and more attention to tapas, as quickfire outlets for creativity and, obviously, something that’s globally popular. And now, thanks to Cruz and his TV showcase, the moderno tapas style has been broadcast into the remotest corners of Iberia, so that even humble small-town bar owners can feel insecure unless they can offer at least a few multi-layer combos on angular plates. And the results can be great. In Utrera, a town around 25km south of Seville without many tourists and where a few years ago you’d reliably have expected the eating options to be nothing but traditional, I found Besana Tapas (http://www.besanatapas.com/), a comfortable bar down a white-washed alley off the main plaza. On the menu were croquettes of squid in their ink with roast garlic, traditional local salmorejo cold tomato soup with the lovely un-trad addition of vanilla, a bull’s tail meatball with wild mushrooms. And, cold cherry and olive oil soup with prawns and mascarpone ice-cream. Wow. Andalusia is the great home of cold soups to pick you up in torrid heat, but this was completely new, and wonderful, a fabulous gourmet refresher for a day when it was over 35ºC. It’s just that simple can be good too. It’s true to say that at one time eating small-scale in Andalusia was often frankly a bit dull, so unadventurous were the lists behind each bar. Now, though, it’s possible to get quite nostalgic for just a fat fresh prawn, plain grilled in salt and garlic.